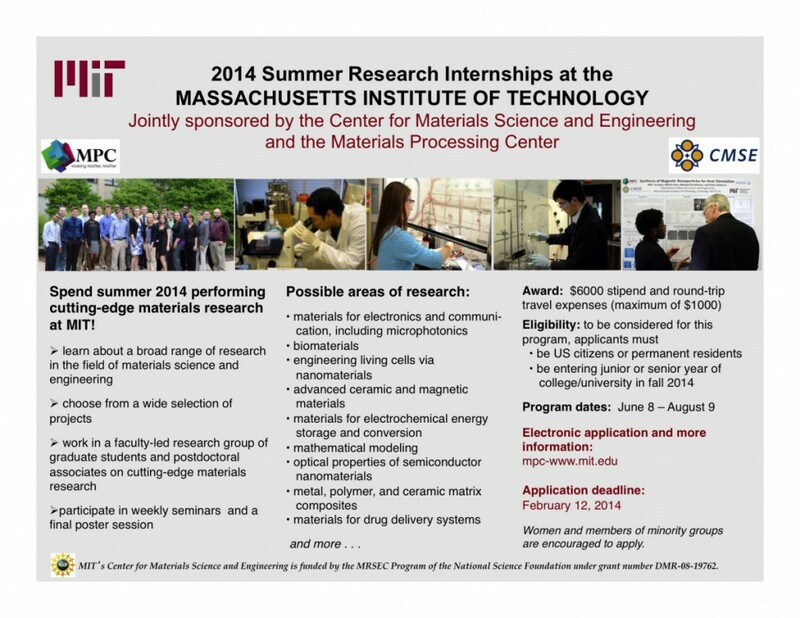 The Center for Materials Science and Engineering and the Materials Processing Center at MIT jointly sponsor a nine-week summer research internship program for undergraduates. This summer, we will offer intern positions to ten sutdents who will work in faculty-led research groups on the MIT campus. Attached is flyer about the program that I hope you will share with your students. Because research projects offered in this program are led by faculty from many different departments at MIT, undergraduates majoring in a broad range of science and engineering disciplines are welcome.Students must be U.S. citizens or permanent residents who will enter their junior or senior year of study in the fall of 2014 to be eligible to participate in this program. Women and members of other underrepresented groups are encouraged to apply. The application deadline is February 12, 2014. If you or your students have any questions about the program or the application, please feel free to contact me.